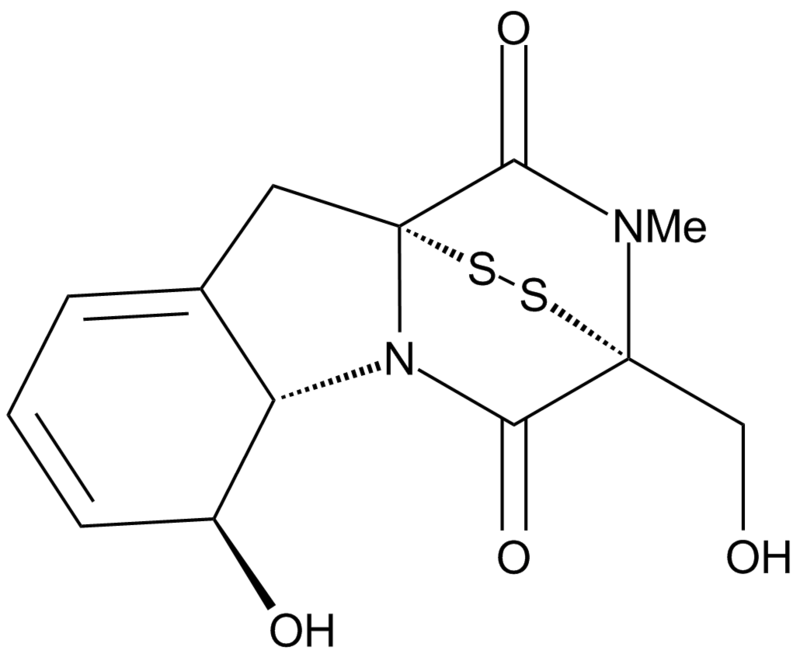 The solubility of this compound in DMSO is >10mM. General tips for obtaining a higher concentration: Please warm the tube at 37℃ for 10 minutes and/or shake it in the ultrasonic bath for a while. Stock solution can be stored below -20℃ for several months. Gliotoxin inhibited proliferation of six breast cancer cell lines in culture and protein prenylation over the same range of concentrations. Treatment with gliotoxin for 24 h led to a clear dose-dependent inhibition of Lamin B farnesylation and Rap1A geranylgeranylation in breast cancer cell lines. Taken together these findings indicated that the observed antitumor activity of gliotoxin in breast cancer cell lines was most likely due to prenyltransferase inhibition. from 1.25 to 25 mg/kg ; subcutaneous injection; weekly for 4 wk. In all rats, all five gliotoxin-treated rats completing the study responded to treatment, three of which had >50% tumor regression (partial response) and two others with stable disease (<50% tumor regression) and the antitumor effects of gliotoxin were manifest within the first week of treatment.
. Vigushin DM, Mirsaidi N, Brooke G., et al. Gliotoxin is a dual inhibitor of farnesyltransferase and geranylgeranyltransferase I with antitumor activity against breast cancer in vivo. MEDICAL ONCOLOGY, 2004, 21(1):21-30. Gliotoxin is an immunosuppressive agent which synthesized by Aspergillusfumigatus and other pathogenic fungi, inhibiting chymotrypsin-like activity of 20S proteasome. A randomized controlled study, which operated in the N-methyl-N-nitrosourea rat mammary carcinoma model, when 10 animals at 10 mg/kg were administered by subcutaneous injection weekly for 4 wk compared with 10 controls, supporting gliotoxin has antitumor activity apparently in vitro and little toxicity. The single doses can be well tolerated up to 25 mg/kg. . The deficiency of the A. fumigatus mutant in gliotoxin-production resulted in less internalization of A. fumigatus conidia into the A549 cells compared with the wild type strain but an increase of phagocytosis by J774 macrophages., Gliotoxin showed to promote A. fumigatus internalization into A549 cells in a dose-dependent manner but inhibit the macrophage phagocytosis when at the concentrations of 10 to 50 ng/ml which are not cytotoxic to the A549 cells. In addition, gliotoxin is able to stimulate the PLD activity of A549 lung epithelial cells. It is efficient for promoting the internalization of A. fumigatus into the cells by this way. Gliotoxin also blocked the production of ROS in A549 epithelial cells significantly at a concentration range from 10 to 100 ng/ml . 1.Pahl HL, Krauss B, Schulze-Osthoff K, et al. The immunosuppressive fungal metabolite gliotoxin specifically inhibits transcription factor NF-kappaB. The Journal of Experimental Medicine, 1996 , 183(4):1829-1840. 2.Vigushin DM, Mirsaidi N, Brooke G, et al. Gliotoxin is a dual inhibitor of farnesyltransferase and geranylgeranyltransferase I with antitumor activity against breast cancer in vivo. MEDICAL ONCOLOGY, 2004, 21(1):21-30. 3.Jia XD, Chen FY, Pan WH, et al. Gliotoxin promotes Aspergillus fumigatus internalization into type II human pneumocyte A549 cells by inducing host phospholipase D activation. Microbes and infection / Institut Pasteur, 2014, 16(6):491-501.